I didn't have enough room in the freezer for another three quarts of stock, so I put it back in the pot to reduce it to 1/4 volume. 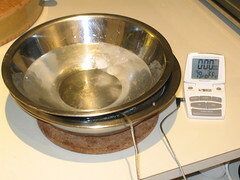 When it was done, I wanted to cool it fast so used my regular ice bowl method. 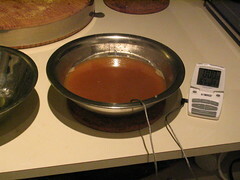 The stock went into a bowl: 167 degrees. On went a bowl of ice water, and after 5 minutes, it measured 79 degrees-- ready to pour into an ice tray. The remaining cup went into the fridge, uncovered: will it evaporate? I marked the level and will check tomorrow.